Possibly? a photograph of Alexander Carmichael, born 1856, Fenelon Township, Victoria County, Ontario, Canada. Photographers [Hamilton] Fowler & [Isaac] Oliver, Lindsay, Ontario, Canada. Private collection. One of the many moustachioed men in my family tree. I'm hoping a closer family member may have a copy of this photo or another of Alexander Carmichael from a similar time period. 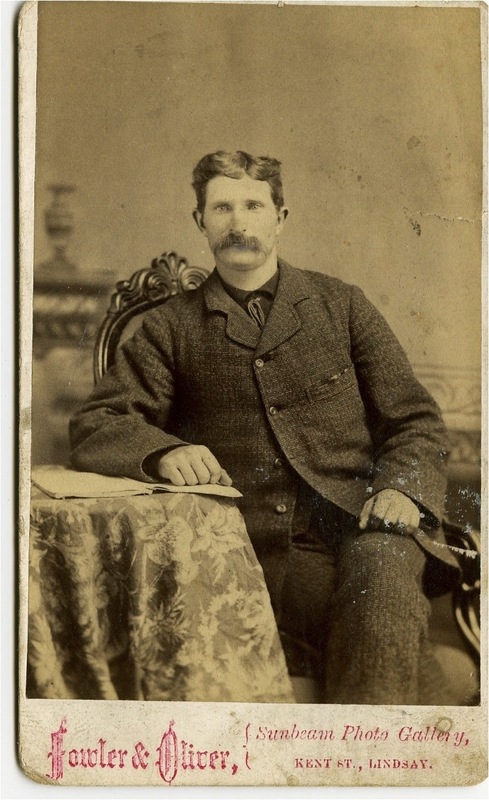 Husband of Esther Ann Currin, - Essie - married 1 January 1885 in Islay, Ontario, Canada. With Essie, he was a parent of Donald, Eliza Ann, John, Daisy, Jessie and Margaret. Son of Margaret Gilchrist and Donald Carmichael, and brother of Janet, Ann, Mary and Margaret Carmichael and Diana Gilchrist. Alexander Carmichael died in 1922 at Newdale, Manitoba, Canada. 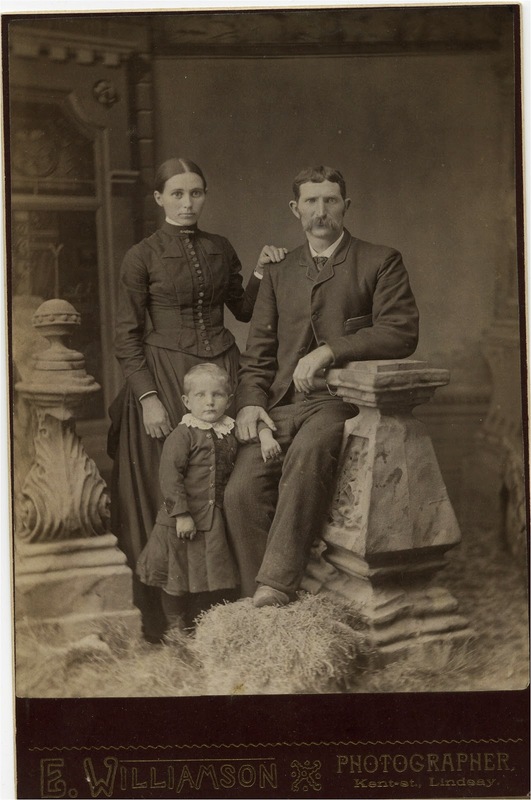 This is a family photograph identified as Alexander and Essie Carmichael with son Donald by my grandmother, Amy Estella Scott, née Irwin. Photographer E. [Eli] Williamson, Lindsay, Ontario, Canada. Private collection. Fenelon, Ontario, Canada marriage registration, 011338, marriage1 January 1885. Ancestry.com and Genealogical Research Library (Brampton, Ontario, Canada). Ontario, Canada, Marriages, 1801-1928 [database on-line]. Provo, UT, USA: Ancestry.com Operations, Inc., 2010. Original data:Ontario, Canada, Select Marriages. Archives of Ontario, Toronto. Harrison, Manitoba, Canada death registration, 1922-030379, death 23 August 1922. Province of Manitoba, Canada, Vital Statistics Agency. More information on this family available from my family files.